Before we begin, I’d like to explain the slightly mischievous title of this post – the first of series which will be published in the coming days. Think of the heading as merely the hypothesis to be debated, and in this series I’ll be looking at a few areas which the most critical fan could point to as being the reason for our eventual relegation. Do not assume that I will proceed to point the finger solely at our defenders for example. I’ll be looking for balance, but of course some of the subjects coming under the spotlight will be more deserving of criticism. To kick things off, let’s take a look at the role Blackpool’s defence may have played in dropping back into the Championship after only one season at the top table. It doesn’t take much of a leap to work out that some of Blackpool’s defending was not up to Premier League level. ‘Pool conceded more league goals than any other side – 78 in total. As good as the Seasiders were in an attacking sense, the way they continued to ship goals week after week was beyond belief. Any team that concedes over 2 goals per game is going to have an uphill task in their bid to stay up, and ultimately it was too much for Ian Holloway’s men. Most concerning from a defensive point of view was the number of late goals conceded. The inability to see out the closing stages was a recurring theme, and even a slight improvement in this area would have been enough to secure a second season in the top flight. Blackpool lost 22 points from winning positions, while gaining just nine when coming from behind. Preventing even one of the last minute equalisers against Fulham, Bolton, Blackburn or Spurs could have seen ‘Pool safe, and that’s only scratching the surface of the late collapses witnessed by Blackpool fans this season. When it comes to Blackpool’s style of play, defending seems to be something of an afterthought. It’s not that ‘Pool have been susceptible to a particular type of attack, or vulnerable to certain styles of team – defensively they’ve been poor across the board. Over the course of the season, there was only one team who could not break them down in either the home or away fixture – Stoke City. Perhaps then, defending long throw-ins is one area in which the ‘Pool defence showed themselves to be adept. The image below shows an analysis of Blackpool’s weaknesses according to the statistics website whoscored.com – and it does not make pleasant reading if you’re a ‘Pool defender. 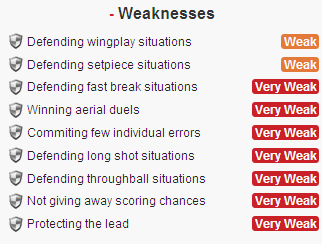 Analysing individuals, it’s fair to say each of the regular Blackpool defenders have had their bad moments. The second game of the season looked to have highlighted Stephen Crainey as a weak link, his performance up against Theo Walcott being a contributing factor to Arsenal’s 6-0 demolition of the Seasiders. On the other side, Neal Eardley has been a notable target for a section of the Bloomfield Road support, being very reluctant to put his foot into a challenge, choosing rather to stand off and let opposing wingers run at him and often get a delivery into the 18 yard box. Craig Cathcart will probably choose to block out much of the second half of the season, beginning with his catastrophic mistake at the Hawthorns which lead to a last minute winner for West Brom through Peter Odemwingie. Cathcart’s performances tailed off as the season wore on, showing perhaps that his youthfulness and relative inexperience could not be relied upon in a relegation battle. 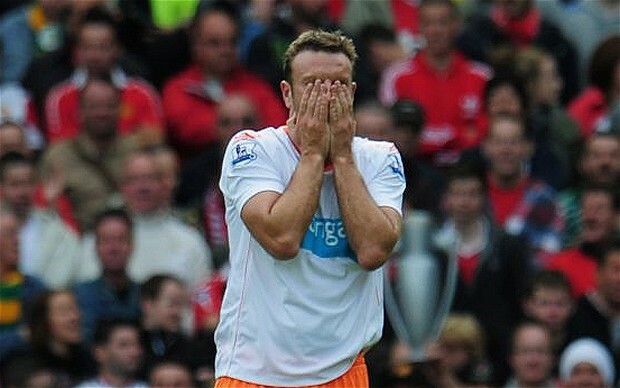 Even Ian Evatt will admit to a few off-days, one of those also coming at the Emirates when he saw red for a professional foul on Marouane Chamakh. And who can forget his unfortunate own goal at Old Trafford? Sad? Yes. Cruel? Affirmative. But a mistake nonetheless. Hang on, now. Aren’t I being more than a little harsh on these players? The answer is of course yes, but for the sake of playing devil’s advocate, the cold hard facts had to be laid bare. It says a lot about these players that despite an on-the-surface defensive record to be ashamed of, you’ll find it hard to locate Blackpool fans who would really castigate any of the team’s defenders to any great degree. Only Eardley has been on the end of some stick from the terraces, but even then most will appreciate the improvement he has made from being a semi-regular in the Championship. Eardley has his defensive frailties, but his overall game suited ‘Pool’s style and he was often an outlet in an attacking sense. Of the other players, Ian Evatt has rightly been praised as one of Blackpool’s most consistent performers this term and was rewarded with the club’s Fans Player of the Year award at the end of season bash. Previously written off by Holloway, who deemed Evatt surplus to requirements in his time at QPR, Evatt made the step up to Premier League football like few ‘Pool fans could have anticipated. The Premier League’s own performance index rated Ian Evatt as the 35th best player in the division, and among the top 10 defenders. The index is calculated on a variety of different factors, and featuring in each and every match did help Evatt’s cause, but to find himself as he does in the company below is some achievement. Stephen Crainey too features in the index’s top 100, weighing in at number 88. Despite the torrid time endured at the hands of Theo Walcott, Crainey managed to put that performance behind him to hold off any challenge for the left-back spot from David Carney, who never seriously threatened replacing Crainey. Craig Cathcart showed excellent compsure in the first half of the season for a player of his age, while Alex Baptiste ended the season strongly. The team’s shape must also be taken into account, as Blackpool play a system that asks a lot of the back four. For the majority of the season, ‘Pool employed a 4-2-1-3 formation with Elliot Grandin in the ‘central winger’ position, only reverting to a slightly more solid flat 4-3-3 towards the end of the season, with Keith Southern being reunited with Charlie Adam and David Vaughan. The 4-2-1-3 offered little protection to the Blackpool defence, and against the quality of opposition being faced it was little surprise they were frequently overrun. Guilty – but only by association. In terms of their effort, Blackpool’s defence could not be doubted – like they whole squad, they often performed at the limit of their ability and beyond, in very trying circumstances. With Holloway’s attacking philosophy a leaky defence was always going to be a massive risk, and the Premier League proved to be too harsh a mistress. The stats don’t lie – they conceded the most goals, but perhaps most importantly, Blackpool fans will not remember these players as being poor – far from it. If the services of Stephen Crainey can be retained, it will a solid base from which to build in the Championship and these defenders will enjoy the backing of the Bloomfield Road crowd. Check back in the next few days for an analysis of why relegation could be Karl Oyston’s fault.